An exhibition curated by Dr. Sarah Bogue, Kelin Michael, and Emma de Jong. Devotion is a fully embodied activity that engages the senses as well as the heart and mind. 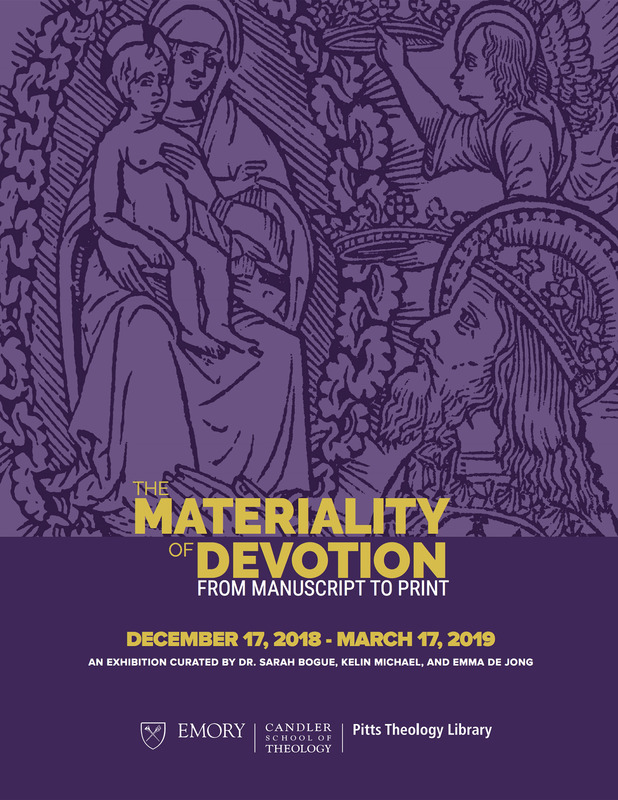 The Materiality of Devotion: From Manuscript to Print provides visitors with the opportunity to explore a variety of objects, texts, and images that supported devotional practices in the medieval and early modern world. The exhibition invites visitors to consider both the form and the content of these sources, which include traditional theological and biblical material as well as musical scores, cityscapes, and poetry. Though these materials have been removed from their original contexts (manuscript leaves excised from full books and books removed from their sacred or secular settings), the exhibition offers a glimpse into the rich and endlessly multimodal world of premodern devotion. The exhibition draws on Pitts Theology Library’s medieval manuscripts as well as its world-renowned early print collection, and also benefits from generous loans made by the Stuart A. Rose Manuscript, Archives, and Rare Book Library and the Michael C. Carlos Museum. We can arrange exhibition tours for all age groups at other times upon request. To arrange a tour, please contact Anne Marie McLean, Reference Librarian and Outreach Coordinator, at 404-727-5094 or amclea3@emory.edu. On Friday March 1, 2018, 9:00 am – 4:30 pm, Pitts Theology Library is hosting a one-day symposium based around the objects and themes of that exhibition. Learn more about this event.